When the nominations for the Rock And Roll Hall Of Fame were first announced I had mixed emotions but, in an effort to be positive, wanting to make the most of things for the fans and with their enthusiasm, I was honored, excited and hoped that somehow this would be a good thing. Of course I realized as things stood, if Guns N’ Roses were to be inducted it’d be somewhat of a complicated or awkward situation. Since then we’ve listened to fans, talked with members of the board of the Hall Of Fame, communicated with and read various public comments and jabs from former members of Guns N’ Roses, had discussions with the president of the Hall Of Fame, read various press (some legit, some contrived) and read other artists’ comments weighing in publicly on Guns and the Hall with their thoughts. Under the circumstances I feel we’ve been polite, courteous, and open to an amicable solution in our efforts to work something out. Taking into consideration the history of Guns N’ Roses, those who plan to attend along with those the Hall for reasons of their own, have chosen to include in “our” induction (that for the record are decisions I don’t agree with, support or feel the Hall has any right to make), and how (albeit no easy task) those involved with the Hall have handled things… no offense meant to anyone but the Hall Of Fame Induction Ceremony doesn’t appear to be somewhere I’m actually wanted or respected. For the record, I would not begrudge anyone from Guns their accomplishments or recognition for such. Neither I or anyone in my camp has made any requests or demands of the Hall Of Fame. It’s their show not mine. That said, I won’t be attending The Rock And Roll Hall Of Fame Induction 2012 Ceremony and I respectfully decline my induction as a member of Guns N’ Roses to the Rock And Roll Hall Of Fame. I strongly request that I not be inducted in absentia and please know that no one is authorized nor may anyone be permitted to accept any induction for me or speak on my behalf. Neither former members, label representatives nor the Rock And Roll Hall Of Fame should imply whether directly, indirectly or by omission that I am included in any purported induction of “Guns N’ Roses”. This decision is personal. This letter is to help clarify things from my and my camp’s perspective. Neither is meant to offend, attack or condemn. Though unfortunately I’m sure there will be those who take offense (God knows how long I’ll have to contend with the fallout), I certainly don’t intend to disappoint anyone, especially the fans, with this decision. Since the announcement of the nomination we’ve actively sought out a solution to what, with all things considered, appears to be a no win, at least for me, “damned if I do, damned if I don’t” scenario all the way around. In regard to a reunion of any kind of either the Appetite or Illusion lineups, I’ve publicly made myself more than clear. Nothing’s changed. The only reason, at this point, under the circumstances, in my opinion whether under the guise of “for the fans” or whatever justification of the moment, for anyone to continue to ask, suggest or demand a reunion are misguided attempts to distract from our efforts with our current lineup of myself, Dizzy Reed, Tommy Stinson, Frank Ferrer, Richard Fortus, Chris Pitman, Ron “Bumblefoot” Thal and DJ Ashba. Izzy came out with us a few times back in ’06 and I invited him to join us at our LA Forum show last year. Steven was at our show at the Hard Rock, later in ’06 in Las Vegas, where I invited him to our after-party and was rewarded with his subsequent interviews filled with reunion lies. Lesson learned. Duff joined us in 2010 and again in ’11 along with his band, Loaded, opening in Seattle and Vancouver. For me, with the exception of Izzy or Duff joining us on stage if they were so inclined somewhere in the future for a song or two, that’s enough. There’s a seemingly endless amount of revisionism and fantasies out there for the sake of self-promotion and business opportunities masking the actual realities. Until every single one of those generating from or originating with the earlier lineups has been brought out in the light, there isn’t room to consider a conversation let alone a reunion. Maybe if it were you it’d be different. Maybe you’d do it for this reason or that. Peace, whatever. I love our band now. We’re there for each other when the going get’s rough. We love our fans and work to give them every ounce of energy and heart we can. So let sleeping dogs lie or lying dogs sleep or whatever. Time to move on. People get divorced. Life doesn’t owe you your own personal happy ending especially at another’s, or in this case several others’, expense. But hey if ya gotta then maybe we can get the “no show, grandstanding, publicity stunt, disrespectful, he doesn’t care about the fans” crap out of the way as quickly as we can and let’s move on. No one’s taking the ball and going home. Don’t get it twisted. For more than a decade and a half we’ve endured the double standards, the greed of this industry and the ever present seemingly limitless supply of wannabes and unscrupulous, irresponsible media types. Not to imply anything in this particular circumstance, but from my perspective in regard to both the Hall and a reunion, the ball’s never been in our court. In closing, regardless of this decision and as hard to believe or as ironic as it may seem, I’d like to sincerely thank the board for their nomination and their votes for Guns’ induction. More importantly I’d like to thank the fans for being there over the years, making any success we’ve had possible and for enjoying and supporting Guns N’ Roses music. 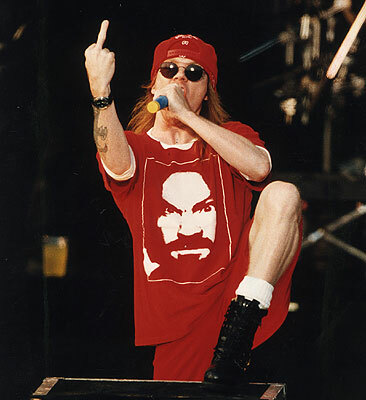 Well everyone on the internet seems to be taking notice of Axl Rose’s letter to the Rock and Roll Hall of Fame. We have too, and in my honest opinion I believe that Axl has every right to not accept the honor of being inducted but I think it would be awesome to see the whole band up there on one stage playing at least one song. I also think it was classy for Axl to not go after former band mates in the letter it shows a certain level of respect, that I respect. 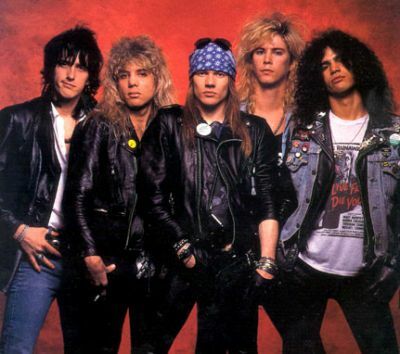 If Guns N’ Roses never gets back together I think I’d be content, as I believe it would just be a bad scene. But I think for one night it would be great for them to bury the hatchet and come together to recognize what they once had. If not for the fans, then for themselves. That is all I have to say on the matter. Tell us what you think!